If you know anything about Maid of Gingerbread, you’ll know two things: 1. I love making gingerbread and 2. I LOVE making gingerbread replicas of real life buildings. It’s one of my favourite bits of my job, taking a brief of a beautiful, awe-inspiring structure and translating it into gingerbread format. The breadth of briefs is amazing too, whether you’re looking for a replica palace for a unique event centrepiece or a llama shaped piñata for an experiential dessert with a difference (Yup, I’ve done both!). If you’ve ever looked at one of my bakes, your first thought was probably ‘how? !’ (sometimes closely followed by ‘why?!’. The answer to the latter is because gingerbread is the best and most delicious building medium; no further questions m’lord.) I thought it’d be a great idea to take you behind the scenes of the process, and explain just how I take giant designs from brief to bake to build. Hopefully it’ll kickstart some inspiration in you and get you thinking about what I can make you out of gingerbread - if you have any ideas head to the bottom of the blog to find out more about the ordering process! Once I’ve got my reference image, it’s time to work out the scale I’m going to work to, drawing rough sketches and diagrams to work out the perfect dimensions. I then cut the shapes out from 2mm thick Kraft board and stick them together using masking tape to create my first mockup of the structure! At this point the design may be a little crude, so I refine it to ensure it’ll work in gingerbread - sometimes this includes a little artistic license to make sure it’s properly sturdy as well as internal structural elements, but it always still looks like the real life building. This is also the stage where the I’ll include holes for the wiring if the design is having internal lighting (like my giant gingerbread Castle Howard). When I’m happy with the design I label every component, take a photo of it from every side possible - gotta work those angles - and then demolish it. But don’t fear, as each template is then cut from gingerbread! The shapes are arranged by size on the baking trays to ensure an even bake on all pieces - miniature pieces can bake in as quickly as 7 minutes, but large pieces take 20-25 to be done properly. When they’re cool, then comes the best bit - assembling them again, but this time out of beloved gingerbread! 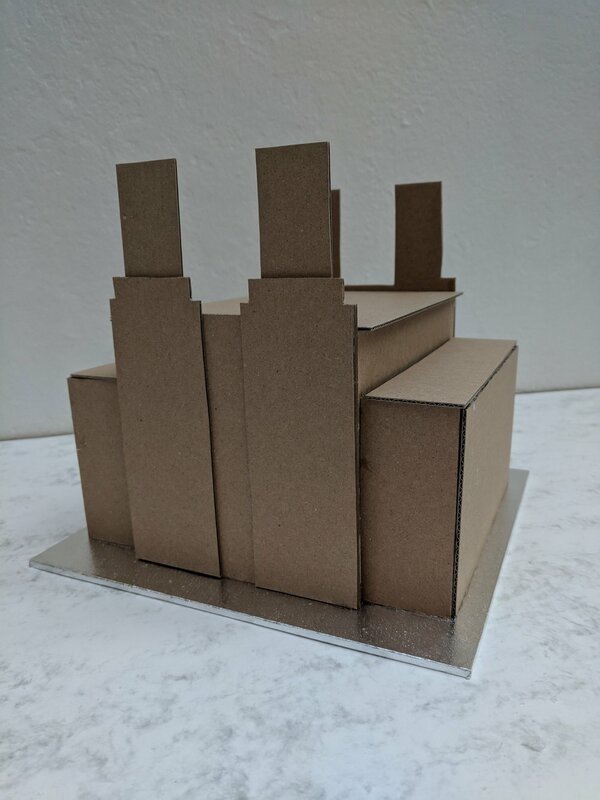 If I have a design that I really like and may want to make again, I often superglue the cardboard template together for visual reference for the future. I’m talking about you, llama piñata. Fancy commissioning a bespoke gingerbread structure? Yay! A very good idea, if I do say so myself. Alongside dates and details of the project, I’ll need good quality photos or drawings of the design, as well as reference images for style or decoration. Even better for buildings are the architects’ plans for each side of the building, as I can then print these out and use as immediate templates. This reduces the design time and therefore the cost. One of the main factors when costing a bespoke gingerbread build is the design time as it can take almost as long as the build itself! How can you order a gingerbread building?